Aw, that’s so cute! It’s a great gift, and I don’t think it matters at all that it was “repurposed” so to speak. The time and love that went into this piece stay the same after all! That’s a good perspective to have. Thank you! Definitely not a lousy thing to do! I think it is perfect. Craft can become a stick we beat ourselves with if we set too many deadlines. This way you can stitch for the pleasure of it and then personalise to make a really special gift. Everyone wins! I like the idea of stitching things up as the spirit moves you, then getting them out later and personalizing them to be a gift. Anything that reduces gift deadline stress is a good thing. And there are lots of people who buy gifts ahead and then keep them on hand for when a gift-giving occasion comes around; this is certainly more personal than that! That’s true. The intent may not have been there 100% of the time, but the thought certainly was. 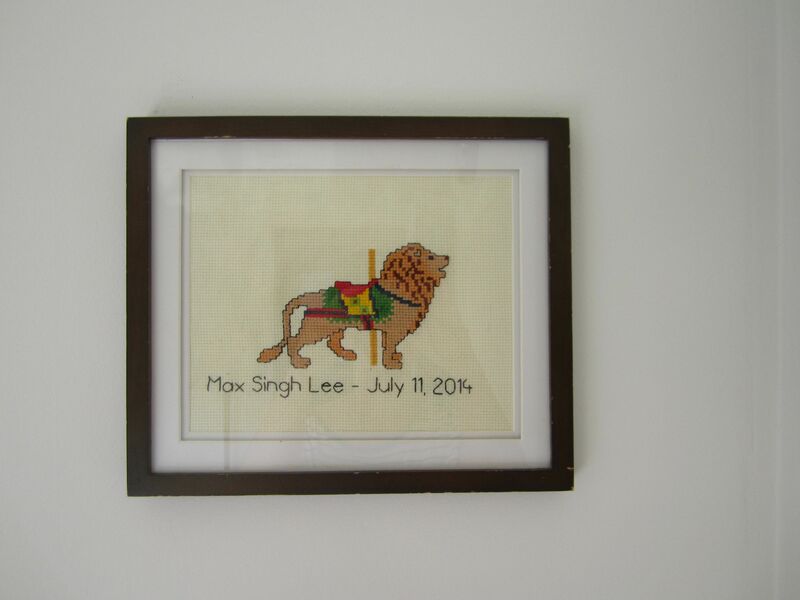 Cute.mi don’t think I have ever stitched a baby gift. I have stitched for my son, he’s 5. I made a monster that helps keep nightmares away. That’s a great idea! My goddaughter has been having nightmares but I doubt another stuffie would help her out. I’d love to see a picture, do you have a blog post about it? Oh it’s so cute! I thought it was a stuffed animal but it’s just the picture. Maybe I will think about making something similar for my ginger haired baby. He actually does have a stuffed animal as well, it’s a bear. I have a bear by the same way that I’ve had for years, Ben. Ben is a special bear because he scares away nightmares. If you have a nightmare then Ben just scares it away so you don’t have to worry, or wake mama up. He’s just a normal stuffed bear, nothing special. I also have a ginger haired child. All I seem to do is make things for babies and children! Several baby knits on the go at the moment, none of which are for me, even though I’m due in January. Behind schedule, as usual! Congratulations! I’m sure the winter holidays will leave you with free time to knit for your wee one, right?? I don’t have any of my own kiddos, just my goddaughter who I live with, but yeah, my life is mostly baby stitching!